Here’s how to put an oomph in your Om. Yoga isn’t always slow paced and spiritual. While downward dogs and sun salutations in a zen environment are a universal way to take a breather from the grind, sometimes our mind needs a bit more stimulation you know? Enlighten on and enlighten strong: these yoga classes with a twist are a challenge for the mind, body and soul. Whether you’ve mastered your mat technique and warrior poses or not, a yoga sesh with a killer soundtrack or epic vibe might be just the shake up your routine needs. Savage beats meet savasana. Take your practice to the sand at San Francisco’s Silent Disco Yoga on Baker Beach. All levels of yogis are welcome to take part in this golden hour class, which has been keeping Californians blissed out since 2013. The premise is easy: provided headphones will play curated beats and instructions from teachers while you reap the sunset glow. Classes from $25, booking essential. 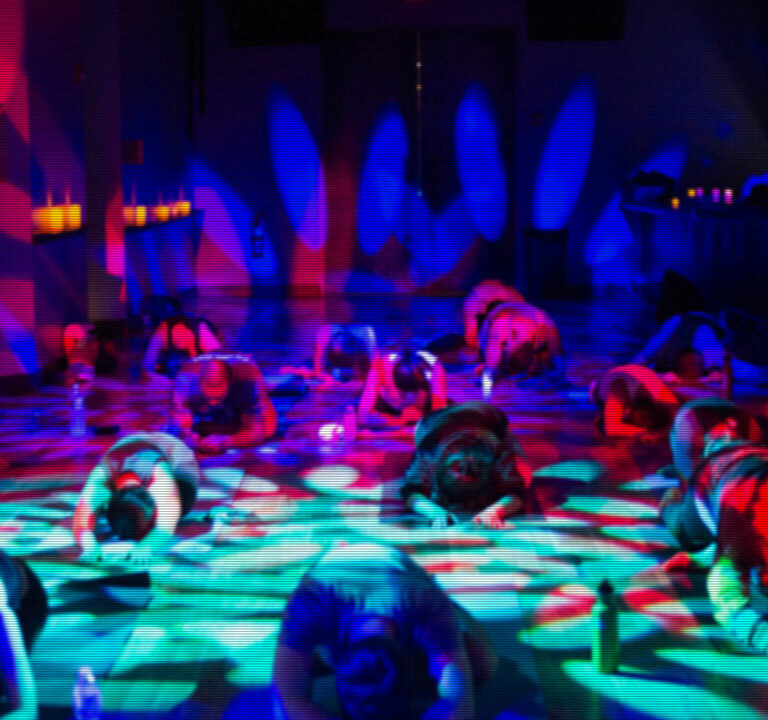 Get ready to flow in the dark at New York City’s first blacklight yoga class. This rad concept brings a SoulCycle vibe to your usual Bikram-style hot workout. Classes are held in a pitch black studio, illuminated only by overhead UV lights. If you really want to get into it, don your whites and neons to get literally LIT UP. Take your chaturanga to the club with an hour long vinyasa flow set to the sounds of deep house tunes. Located in Brooklyn’s glitter mecca, House Of Yes, a live DJ and instructor fuse chakras with chill beats. Not that you need any other incentive to bring some disco groove to your Saturday morning routine, but there’s usually free kombucha to fuel up on after class. Here. For. It. Get upside-down and feel those endorphins pumping. Om Factory brings a dynamic community of all abilities together for their signature Aerial classes. We don’t usually like rules, but we’ll adhere to their request that everyone must start out in a beginner class. Quicker than you can say flip, you’ll find yourself hanging with the best of them. When the tagline states ‘yoga for your dark side, spirits for your soul’ you know it’s gotta be the good kind of dark stuff. Cobra Club’s Metal Yoga is all about saluting to the moon and connecting to the dead while your body feels the burn. You’ll find no incense, chanting or Buddhas here as the sounds of Motorhead and Metallica fill the studio. It’s more corpse pose > child pose, if you get us. Sweat drippin’ beat pumpin’ Yo to the Ga. At Y7, the OG Hip Hop yoga studio, yogis flow hard in a class that is pure fire. Instructors take you through an hour long hustle which gets you tuned in, sweating, working and breathing in order to restore your equilibrium in a badass way.